A DA youth member Luzuko Mngqibisa escaped unharmed, but lost all his clothing when his Tambo Square home was set alight in what appears to be a politically motivated attack. The arsonists left Mngqibisa a note in which they called him a dog of Helen Zille. Police spokesman Lieutenant Colonel Andre Traut said a case of arson had been opened. Traut said that he can confirm that an arson case is under investigation by the Gugulethu police following an incident of a fire in NY 178. Traut added that no arrest have been made as yet. KwaZulu-Natal police on Saturday said a man was arrested after a search was conducted at an apartment in Sydenham, near Durban. Captain Thulani said drugs with a street value of R712 000, including 8909 mandrax tablets, were recovered. Zwane explains that the K9 officers worked on intelligence gathered information about a man from Ntambanana area selling drugs at Esikhawini and surrounding areas. He added that information indicated that he was keeping drugs in his homestead in Ntambanana. “The combined team of officers went to the suspect’s residence where one hundred and seventy nine mandrax tablets,” said Zwane. Nine people were seriously injured after the they were travelling in overturned on a gravel road in Maselspoort near Bloemfontein. Netcare 911’s Chris Botha said that a Toyota Condor with people on board went down a road and overturned. Botha added that upon their arrival there were 9 people that were injured and they were all stabilized in scene and transported to various hospitals for further medical care. The exact details to the cause of the incident and preceding events will remain a subject for police investigation. The ACDP in the WC congratulates the WC government and the private sector for a trend of foreign investment boosts in the Province. ACDP leader Ferlon Christians said that at the same time he wants to draw attention to the latest toilet saga and violent service delivery protests and said that these can have potentially damaging affects on the City’s reputation. Christians said that as the ACDP they are very glad and they have noted that the current business and investments are picking up in the Western Cape. “We encourage government to give incentives to the private sector, when job creations and those things cone to the fore that there are incentives for those business that attracts investments,” added Christians. He also said that government should create an atmosphere where people can invest. The National union of Mineworkers congratulated its ally, the National education health and allied workers union on a successful congress which ended today. Spokesperson Lesiba Seshoka said that the NUM congratulates in particular all the elected leaders of the union and also looks forward to a closer working relationship. Seshoka said that the NUM is particularly overwhelmed by the unwavering support it received from congress in the wake of constant attacks it faces in the mining sector both from mine bosses and from so-called rivals. He added that the special resolution sponsored and adopted by congress in support of the NUM is a living testimony of the long standing and historical comradeship the two unions enjoy and the values they both share. The ACDP in the WC has condemned acts of mob justice in the strongest possible manner. ACPD spokesperson Ferlon Christians said that they are calling on communities to refrain from pursuing mob justice and to accept the principle of natural justice until proven guilty. Ferlon Christians said that as the ACDP they condemn the mob justice that occurred in Delft. “The ACDP knows that the community is very frustrated with the police and the justice system when it comes to dealing with criminals,” said Christians. He added that they know that criminals thy get caught go to court and they get released on bail and when out on bail they do the same crimes and they are aware that there are a lot of problems when it comes to the justice system. The South African Municipal Workers Union agreed at the National Executive Committee meeting that they will turn up the pressure because negotiations in the Local Government Sector have collapsed. Samwu Spokesperson Tahir Sema said they are now mobilising its members with the purpose of engaging in industrial action as soon as possible. Sema said that the union has taken this decision due to the collate of negotiations between itself and the employee body SALGA. He added that the body has negotiated in bad faith and due to that, other negotiations has collapsed. Sema said that the union has taken this action in order to get the employer to come back to the negotiating table and find a solution to the dispute. The North West Police said stock theft has become a problematic crime in the country. The two suspects aged 44 and 58-years-old were arrested this week after they were found stealing a cow and two sheep. North West Lieutenant Colonel Lesego Metsi said both suspects are expected to appear in the Potchefstroom Magistrate Court on Monday. Metsi added that when they caught the suspects they had already slaughtered the cattle. Furthermore he explains that they also recovered meat from a freezer along with skin and the head of the cow. “During further investigation police also managed to get two hidden cows inside a tavern,” added Metsi. The African National Congress in the Western Cape has called on the National Prosecuting Authority to exert the fullest extent of the law on the protestors who dumped human waste at the Cape Town International Airport. ACDP Western Cape leader Ferlon Christians said the sanitation issues in the Cape needs to be resolved cordially and in a peaceful manner. Christians said the NPA was asked to sentence the offenders strictly to make an example of them. “It is an international airport, we get foreigners and investors, NPA needs to be strict and not give these people bail” Christians added. The Hawks arrested a third suspects in connection with the R79-million fraud in Limpopo for illegally awarding a contract for bridge construction in Sekhukhune. 37-year-old Paul Nkosi is a director for UMSO Construction company was arrested after he handed himself over to the Hawks’ Anti Corruption Task Team. Captain Paul Ramaloko said the man is part of two people arrested on Tuesday in connection for fraud. “He was given R10 000 bail, while his two co-accused were given R5 000 each” Ramaloko. The Democratic Alliance has welcomed the decision by the Bellville Magistrate Court on Thursday to not grant bail to the nine people who were arrested for dumping human waste at the Cape Town International Airport. Leader of the DA in the province Ivan Meyer said he hopes justice will take its course. DA spokesperson Cameron Arendse said Cape Town is the leading sanitation provider in South Africa; with the 1.3 million houses with no sanitation at all, none are in Cape Town. “Of the 88 000 bucket toilets identified by government across the country, only 0.4% are in the Western Cape” Arendse added. Arendse said that the DA will continue to provide services as best as they can. An accident on the M25 Durban bound this morning left twelve people injured. It is believed that a taxi overturned near the Bridge City. The exact details to the cause if the accident and preceding events will remain a subject for police investigation. Netcare 911 Spokesperson Chris Botha said when paramedics arrived on the scene; the wreckage was spread over a large area. “The was a total of twelve people who were injured; they were treated on scene and transported to various hospitals for further care” Botha added. The Western Cape Education Department has identified 96 under performing primary schools. These schools were identified by the annual national test language result for last year. Training for maths and language teachers has also been provided by the WCED during these school holidays. Ministerial Spokesperson Bronagh Casey said each of the schools have to implement time for improvement in 2013. “The WCED will be providing extra support to those schools; we would like parents to help support improve the language and maths results” Casey added. Correctional Services Minister Sibusiso Ndebele has commended the Department of Correctional Services for intensifying its efforts towards ensuring that prisons shift to institutions of new beginnings. Ndebele said it is important to deliver justice for victims and ensure that offenders make restitution both to society for their crimes, and leave correctional centres with better skills and prospects. Ministerial Spokesperson Logan Maistry said DCS officials in the Western Cape are undertaking a community outreach programme this week, in the southern Cape, where DCS is also donating state-of-the-art wheelchairs to 54 disabled children, women and men. Maistry added that the 26th June, in Ha Mutsha in Limpopo, ex-offenders were handed business starter packs to start their own businesses including welding, building, scaffolding, carpentry, sewing, plumbing and car washing. The South African Human Rights Commission hosted a Business and Transparency conference on Thursday at the Sandton Convention Centre. A number of issues were raised at the conference which will be developed into a report and shared with business stakeholders to craft a national action plan for South Africa in the implementation of the recommended UN guiding principles. HRC Spokesperson Isaac Mangena said the conference aims to address the state of compliance and a link between business and human rights. The Competition Commission is currently investigating over R29-billion worth of projects in the construction sector alone for bid-rigging abuse of public tenders by 21 companies. Health Minister Aaron Motsoaledi on Thursday said dumping of human waste during protests in Cape Town is an attack against the whole population. Nine people appeared in the Bellville Magistrate Court on Thursday after they were arrested on Tuesday for dumping human waste at the Cape Town International Airport. Motsoaledi said human faeces can cause an outbreak of diseases such as cholera. Ministerial Spokesperson Joe Maila said this is not the way of protesting, because dumping human waste can cause diseases like typhoid. 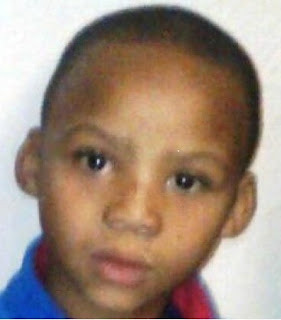 The Mitchell’s Plain Community Policing Forum has confirmed that 6-year-old Andre Maggels has been found. He went missing on Thursday after he was last seen playing with his friends outside his aunt’s house in Mitchell’s Plain. Abby Isaacs from the Mitchell’s Plain CPF said the boy was found in the Talfelsig area today. Isaacs further added that they would like to thank the South African Police Service, the neighbourhood watch, the CPF street committee and each and every community member in Mitchell’s Plain that assisted in finding the boy. The Shongweni K9 unit arrested two suspects for house robbery and stolen goods. The two suspects aged 29 and 33-years-old have been linked to numerous house robbery cases in the upper highway area including Hillcrest. Captain Thulani Zwane said the members recovered a lot of staff that is suspected to have been stolen in house robberies in Pinetown and surround areas. Zwane added that the suspects are due to appear in the Pinetown court soon on charges of robbery and house breaking. 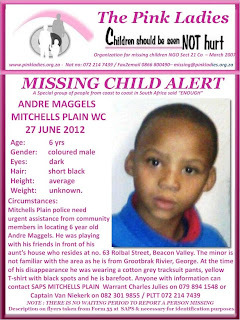 Mitchell’s Plain Police are seeking the assistant of the public in finding a missing 6-year-old boy Andre Maggels. 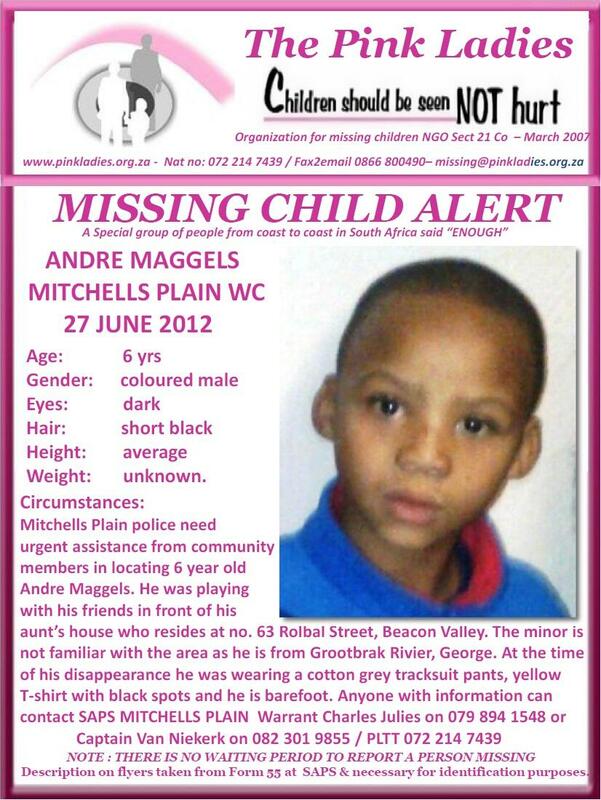 He was playing with his friends in front of his aunt’s house in Mitchell’s Plain, when he went missing. Police Spokesperson Andre Traut said at the time of his disappearance he was wearing grey tracksuits pants and a yellow t-shirt and he is new in Cape Town. 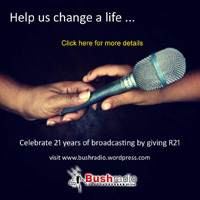 He added that anyone with information can contact crime stop on 08600 10111. 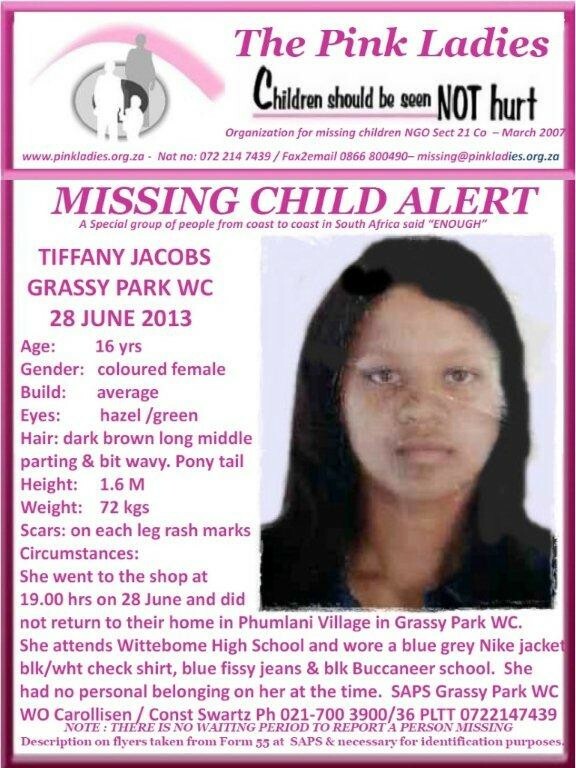 Meanwhile the police are still searching for 8 year old girl from Grassy Park. Kiana Williams went missing nearly two weeks. The Democratic Alliance said it applauds the decision by the City of Cape Town to provide a free basic allocation of water and sanitation for old-age homes and homes caring for the physically and mentally challenged. DA MP of Human Settlements Stevens Mokgalapa said the basic services for the most vulnerable should be provided free of charge. Mokgalapa said they acknowledge the record of the City of Cape Town in provision of water and sanitation in the country. He added that the City has a 100% percent record in water and sanitation provided to the Citizens. Meanwhile residents in the City continue to stage poo protests and that they claim is their way of showing their dissatisfaction with the City in providing them with proper sanitation. The residents last month were given portable flush toilets by the City of Cape Town after Months of complaints about their toilets not being cleaned for three months. Residents started protesting by throwing human waste at the Provincial legislature and recently at the Cape Town International Airport. Nine people were arrested and appeared in Court on Thursday but their court hearing was postponed for July 4th. Among the arrested is Andile Lili and Loyiso Nkohla, who are members of the ANC Youth League. The Western Cape MEC of Finance, Economic Development and Tourism Alan Winde said the province has attracted foreign investment worth R4.4 billion in 2012. MEC Winde said the number show investor confidence for the province is positive, although the value of the investments decreased the number of projects increased from 22 in 2011 to 26 in 2012. Winde said despite the fragile international space SA operates in, with regards to attracting foreign investment; in 2012, 26 direct foreign investment in various companies. Winde added that it the investment was especially directed into renewable energies. The Pinetown Family Violence, Child Protection and Sexual Offences Unit is seeking the help of the public in locating a missing one year old baby from Clermont. The baby was stolen on Tuesday afternoon. Captain Thulani Zwane said it is alleged that a woman pretended to befriend the child’s mother and offered her a job, thereafter took the child. “No arrest has been made as yet; anyone who might assist us with information of the whereabouts of the woman or the baby to please contact the nearest police station or our number on 0860010111” Zwane added. In a statement released late this afternoon President Jacob Zuma said Former President Nelson Mandela’s condition has improved. President Zuma visited Mandela in hospital today where he was informed by the medical team that Mandela remains critical but he is now stable. Presidential Spokesperson Mac Maharaji said the medical team continues to do a good job, and urged the public to pray for his health. “The presidency is disturbed by the rumors that are being spread about former president Mandela’s health. “We appeal for respect for the privacy and dignity of the former president” Maharaj added. Western Cape police have confirmed that two people have been arrested following the murder of an off-duty police officer on Wednesday morning in Lwandle near Strand. Police Spokesperson Andre Traut said the circumstances surrounding the murder are being investigated. The motive for the killing is still unknown at this stage. Traut said the two suspects aged 30 and 36-years respectively will appear in court after they have been charged. Meanwhile MEC of Community Safety Dan Plato said any acts of violence against hard working police officers who provide a valuable safety service to the public must be condemned in the strongest possible manner. Ministerial Spokesperson Greg Wagner said MEC Dan Plato emphasised that an attack on the police is an attack on the state and this is completely unacceptable. Wagner said MEC Plato has welcomed the arrest of the two suspects. ER24 Paramedics today rushed to a scene whereby a taxi collided with a light motor vehicle in Stellenbosch, which left scores injured. ER24 Spokesperson Vanessa Jackson said 14 patients were on the scene. Jackson added that four of them were critically injured too seriously and the other eight were treated for minor to moderate injuries. The exact details of the cause of the accident are being investigated by the police. The ANC’s Women’s League is today picketing in front of the Knysna Magistrates court to protest against domestic violence. This is after a woman was stabbed and killed by a former partner in front of her 12 year old daughter. The suspect 33 year old Bulelani Bangani has been granted the opportunity to apply for bail. Spokeswomen for the ANC Women’s League Vinolia Gugubela said they are going to handover the petition to the senior prosecutor that no bail for the suspect. President Jacob Zuma has discouraged speculation about Former President Nelson Mandela’s health. Zuma visited Mandela in hospital late last night where he found the elderly statesman still in a critical condition. President Zuma also cancelled his planned trip to Mozambique. Mandela was admitted to the Medi-Clinic Heart hospital in Pretoria on June 8th for a recurring lung infection. Presidential Spokesperson Mac Maharaj said the President has decided to cancel his visit to Maputo due to take place today, where he was to attending a SADC summit. Maharaj added that he has reiterated his gratitude on behalf of government, to all South Africans who continue to support the Madiba family. Western Cape Premier Helen Zille said the on-going toilet war is disrespecting Former President Nelson Mandela. Nine people were arrested on Tuesday after they dumped human waste at the Cape Town International Airport. Premier Spokesperson Zak Mbhele said at this time when the nation is coming to terms with former President Nelson Mandela’s ailing health, for these actions to continue is disrespectful. Meanwhile the Social Justice Coalition has given the City of Cape Town three months to come up with a viable plan to tackle the ongoing sanitation crisis in the informal settlements across the City. This comes after more than three hundred residents from the Social Justice Coalition marched through the City of Cape Town and handed over a memorandum to the human rights commission and to a representative from the Mayor’s office on Tuesday. Spokesperson for the SJC Phumeza Mlugwana said they have two weeks to ensure to start drafting a policy and plan, 8 weeks to ensure that they engaged communities in that plan and three months ensure that there is an operation plan. A parliamentary question by the Democratic Alliance has revealed that Police Minster Nathi Mthethwa knew of the presence in South Africa of Muammar Gaddafi’s former chief of staff Bashir Saleh as early as February. DA MP of Finance Tim Harris said this is in contradiction of President Jacob Zuma’s statement that government was not able to monitor or prevent the movement of Saleh. Harris said this man has allegedly controlled some flow of funds from the former Libyan dictator into South Africa. He added that there should not be any relations between this man and the ANC. 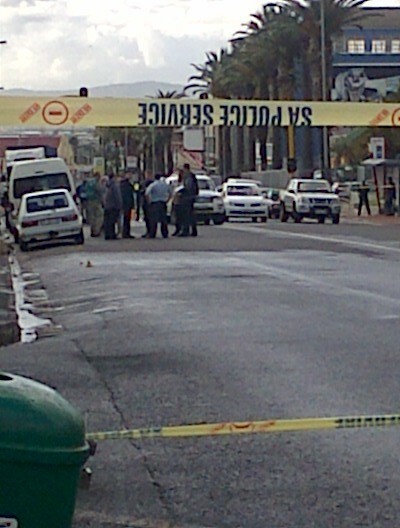 An off-duty police officer was shot dead in Lwandle near Strand on Tuesday evening, while he was on his way home. The motive for the killing is unknown at this stage but police are investigating. This is the second officer killed in the country this month alone, the other one was Senior Johannesburg Officer Tirhani Maswanganyi whose body was found dumped and bound outside Pretoria. Police Spokesperson Andre Traut said two suspects aged 30 and 36 were arrested. 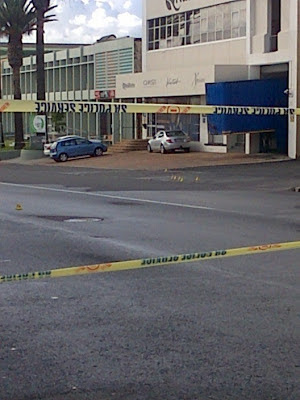 “The police constable was shot and killed at approximately 01:30 In Strand,” adde Traut. Traut also said that circumstances surrounding the matte are being investigated. The Communications Workers Union today said the recent ruling of the Press Ombudsman in the matter involving Minister of Communication Dina Pule shows that , to root out bad elements in the media. A local newspaper was cleared by the Press Ombudsman for breaching the Press Code. CWU National Spokesperson Matankana Mothapo said they are of the view that the Sunday Times has broken the conduct of the company by leaking certain information to deal with the integrity of some leaders in Government. “The outcome against Minister Pule is not fair,” added Mathapo. Western Cape MEC of Education Donald Grant today visited the Esangweni Secondary in Khayelitsha where Grade 12 learners are participating in a Winter School programme in preparation for the 2013 National Senior Certificate Examinations. The WCED said the winter school programme will benefit learners from over the 200 high schools in the province. Ministerial Spokesperson Bronagh Casey said that this year 216 high schools will be participating in the grade 12 winter school program. “Many of the programmes on offer will be to taught by tutors selected by the WCED and some schools curriculum advises will also be supporting and assisting individual school programmes,” Casey said. Furthermore Casey said that the department has also arranged for additional resource materials to be developed to compliment the lessons being presented. Casey also added that the winter programme is complementing existing programmes at the selected high schools in order to improve performance particularly at underperforming schools. She also said that the WC government has managed to reduce the number of underperforming schools from 85 to 26. North West Premier Thandi Modise has called for united action against the scourge of drug abuse and illicit trafficking. Modise said communities need to support young people by identifying and blowing the whistle on drug lords and those establishments that are selling alcohol to the underage. Premier Spokesperson Lesiba Kgwele said that there is a need to intensify the onslaught against drug and alcohol abuse to build a drug free South Africa and communities that care. “Because we cannot afford to loose our youth who are our future leaders to drugs like nyaope and alcohol abuse,” Kgwele said. Kgwele also added that research has confirmed that young people who start drinking alcohol at a young age are five times more likely to develop alcohol abuse or dependent that people who first used alcohol at ages 21 or older. This afternoon a security guard was wounded in an alleged cash in transit heist in Woodstock. The exact details are not known at this stage but the security guard is in a critical condition in hospital. ER24’s Vanessa Jackson said that they treated the man for gunshot wounds and then transported him through to the local medi clinic for further care. “At this time police are still investigating and we don’t really know what transpired there but we can confirm that one person was injured in the incident,” added Jackson. The National Youth Development Agency said it is fighting drug abuse in the Western Cape Schools. NYDA partnered with the South African National Council of Alcoholism to train 520 learners in the province. Young people from different communities will be responsible for helping learners in the early stages of drug use for professional counseling, as well as running on-going awareness and prevention campaigns. Chairperson of the NYDA Yershen Pillay added today marked the graduation of those 520 young peer counselors who will be expected to counsel their peers in schools and communities.